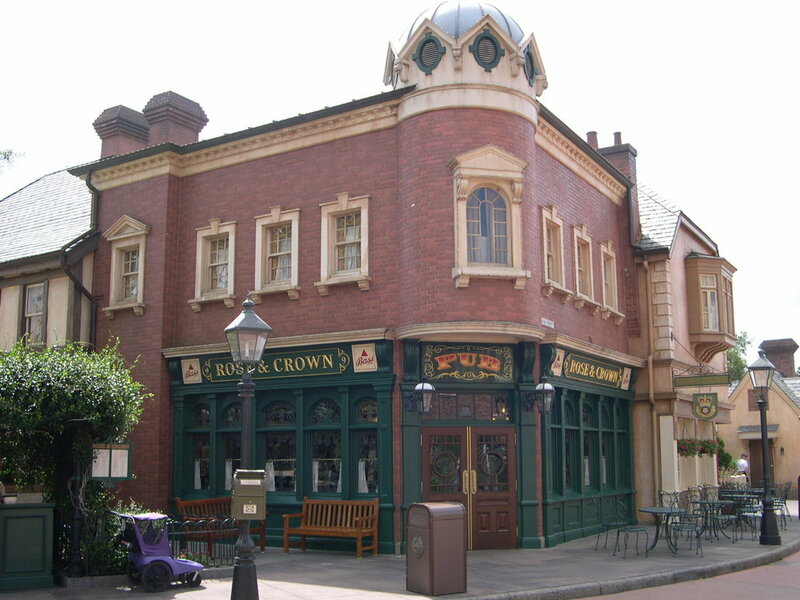 A few years ago, my wife and I took our children to the Rose and Crown Dining Room in the United Kingdom pavilion at Epcot. After a long wait, lukewarm food and high prices, we decided we would never venture there again. So, when my fellow Touring Plans blogger Todd Perlmutter and his lovely wife suggested that we meet there for lunch, I was concerned. Turns out, there was no need. It was the four of us for lunch at Epcot on a busy Saturday afternoon, yet once we checked in it was only a few minutes before we were able to be seated. Within moments, our waitress appeared and was able to take drink orders. When we had a special request, the chef came out and chatted with us all about not only what we wanted to eat, but other things that were going on around the park. 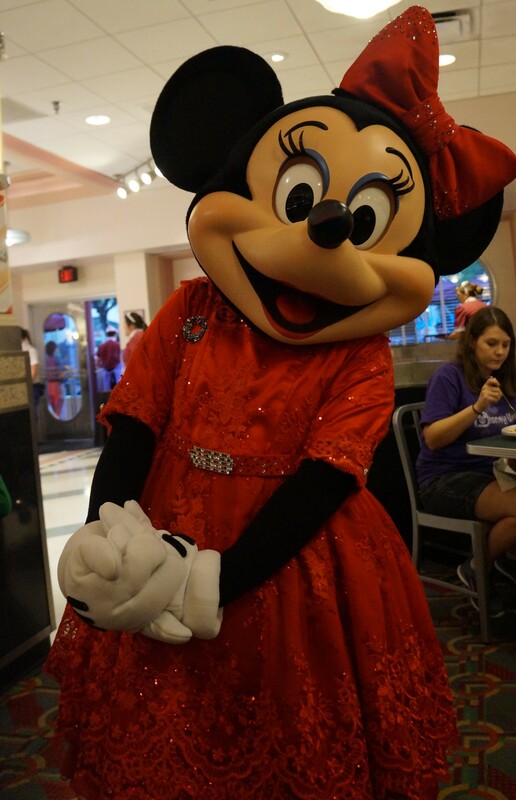 Having been to Walt Disney World as much as I have, I’m used to cast members being nice. But throughout this meal, the cast members were exceedingly nice to us. 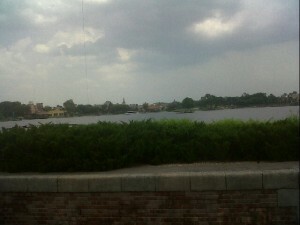 We were seated on the exterior of the building near World Showcase Lagoon, and it began to rain. Our waitress and the staff jumped to our aid, pulling the table away from the rain at first, then changing our table. They were wonderful about the entire thing. The view from our table. Notice the approaching storm clouds. So the service was great, but how was the food? Last time I was there, I had a steak that was unbelievably bad. This time around, it was a complete change. I ordered the Doncaster burger, which sounds like a heart attack on a plate. Eight ounces of angus beef, topped with a fried egg, bacon, cheddar cheese and horseradish cream. I had the cream on the side, since I don’t normally enjoy horseradish. This was good, though, once I spread it on the burger. It was lighter and creamier, and added to the flavor. I have to say, this may be the best burger on property. There, I said it. I am somewhat of a burger aficionado, and in general, I think Disney’s burgers are pretty bad. Beaches & Cream and Pecos Bill’s are okay, but not the same caliber as something you’d get outside the parks, like Five Guys or some local restaurants around my house. But the Doncaster is fabulous. The chef explained that it was something that is served in pubs in Doncaster, and he decided to add it to the menu. He related that the chefs had visited other pubs and locations around the United Kingdom, and that more pub food items would be coming. I say bring it on. My wife ordered the fish and chips and was presented with two large pieces of cod and fries. While it did not seem like anything special, it was exactly what you would expect from fish and chips ordered in an English pub, but if you want fish and chips, you’re probably better off at the Harry Ramsden’s stand around the corner or at Raglan Road. 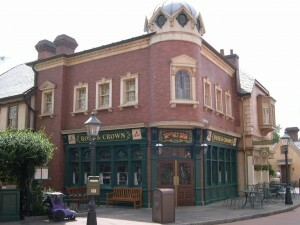 Besides the Doncaster, the main reason you would want to go to Rose and Crown is the beer. They have it all here, from Guinness to Harp to Smithwick’s to any mixtures of the above and more. My advice to you is that you don’t drink beer because you’ve tried the domestic brands in a can and didn’t like them, you should try draught beers at Rose and Crown. Talk to the waiter or waitress and tell them your tastes, and they’ll suggest something for you. I could not have been more pleased with our dining experience at Rose and Crown this time around. From the service to the food to the company, it was a marvelous experience. If you are looking for a lunch spot in Epcot with a magnificent view, you would be hard pressed to find a better spot than Rose and Crown. 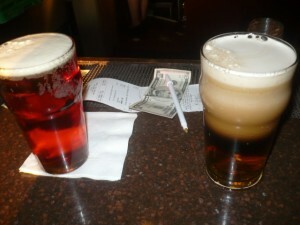 Enjoy a nice beer, grab a Doncaster and enjoy life for the afternoon. Thanks for the review! My sister just booked an ADR for us at R&C in August, and it’ll be our first time dining there. I was a little hesitant because of negative reviews I’d heard in the past. I’m pleased to hear they seem to have turned things around! We had lunch at the R&C on 6/1/11 and had a fabulous meal. Our group had fish & chips, the Doncaster burger and shepherd’s pie. It was all delicious and my husband and father-in-law raved about the beers. We had an excellent server who was just delightful and consider this to be one of our better meals on our trip. We would have no qualms about considering the R&C again. After reading your review I really want to try that burger. We already new how great the beer was there, we always stop there when going around to each country and last year our whole family all 11 of us ate at the Rose and Crown and we loved it. Our food was great and we got to see the fireworks while still in there. The fish N chips were great and we also had the meat & cheese platter (don’t remember the real name of it)that went over bug even with the kids. The only complaint we had was waiting for the table even with our reservation we waited an hour or so to be seated, not great when we were starving. Thank you for your review. Having lived in England for a short time and loving the food at the local pubs in our area and in London, I have been wanting to visit the R&C for a while now. Maybe this September when it’s just the DH and I, I will get ADR’s. My wife and I had lunch there in April. It was our first time there and I had the Fish & Chips which were excellent and I don’t remember what my wife had but I do recall she enjoyed it. Our waitress was a most delightful lass from Ireland. We had an ADR, made online the night before and we were seated promptly. We will return. Just had our first meal there last month. We loved it! I had the bangers and mash and thought the gravy was absolutely delectable. I am ready to go back already. We were just there on June 6th. Delicious as usual. I have never had a problem with the food there sticking to the traditional fish and chips. We also shared a salad appetizer that was wonderful – can’t remember the name. Love the Rose & Crown. My wife’s family is from England, so I’ve become a bit of (okay, a huge) Anglophile. The beers are great – try a pub blend such as the Bumblebee (Boddingtons and Guinness) or the Golden Fox (Boddigntons and Bass) for something truly unique. The appetizer trio was deilicious – especially the Potato and Leek Soup (which you might consider ordering just by itself). I had the sheperd’s pie which was really nice and flavorful. They have a great kids menu, too. Our son (age 2.5) had the bangers ‘n mash (truth be told he ate all of the bangers and none of the mash). Plus, it came with ice cream and toppings for dessert. If you go early enough (as we do with a young child), you can grab a nice table outside. Or as many people do, try to go later and get a table outside to watch the fireworks. Even if you don’t visit for a full meal, at least stop by R&C for a proper pint. And ask for Mark from Doncaster – really great server with whom we enjoyed talking football and British television! We were going to eat here on our trip to Disney last year but they seated outdoors.It was a very hot day and after touring Epcot we wanted to sit in a cool airconditioning restaurant.There were no available tables indoors so we got up and left before we ordered anything and ate next door at their counter service place even though it was outdoors it was alot less expensive and we could use our quick service dining plan there.There were no tables available so we took our food and ate near the water way near Italy.It was so peaceful,cool and quiet and we enjoyed our delicious fish and chips with beautiful scenery. I second the appetizer trio, although the standout for me was the Scotch Egg.